An attack avoided is a better result than a fight that is won. Battles can result in injuries, casualties and often unwanted criminal or civil litigation. When confronted by a violent threat we may have response options to avoid, escape, deescalate or defend. If we have advance information or intelligence regarding the potentially hostile nature of an area or event, we can avoid a situation altogether. Other times we’re in the midst of an attack and have to respond accordingly. Nonviolent conflict resolution and de-escalation is a preferred response, yet is not always an option based on the totality of the circumstances during a violent encounter. Whether the threats are criminals, terrorists, kidnappers, human traffickers, organized gangs or protestors, we need to recognize when something is not normal for the environment and doesn’t look or feel right. A defensive mindset helps to stay in the zone of situational awareness where we spot a potential threat, assess the threat, analyze response options and take appropriate action. These subjects have depth and some key details to help survival and winning against violent encounters and will be addressed in other articles. Develop a Warrior Mindset when forced to stop a threat if you choose to fight back. Maintain a mental focus of survival and protection. Survive at all cost. Learn some basic self-defense and protection methods such as Krav Maga (Israeli Combat System) and consider carrying firearms and other weapons where legal. In order to protect others (family, friends, associates) you have to protect yourself. Legally you have the right to defend yourself. Your MIND is the most important weapon; everything else are tools and force multipliers (hands, feet, elbows, knees, knives, firearms, improvised weapons). Adopt the Warrior Mindset that You Will Win, You Will Survive under any and all circumstances. Mentally train to defeat any threat. This is not to underestimate the capabilities of an attacker, rather to defend and win with greater intent and determination. With superior mental determination and physical preparation, you have the decisive advantage. Train to react instinctively with speed, efficiency and the appropriate measure of force. 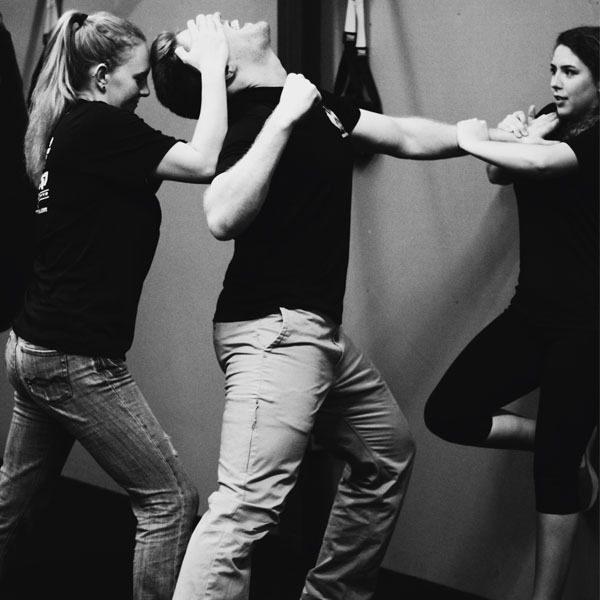 The essence of Israeli Krav Maga is to neutralize the threat quickly and effectively. Defensive tactics deploy the principles of speed, surprise and aggressive counter force. Defend quickly when the timing and circumstances are right. Violent encounters are often over quickly. The first 3 to 5 seconds are critical to deploy defensive skills. Many tactics often work the first time providing the element of surprise. Maintain total commitment and continue to defend until the threat stops. Realistic training and tactics under stress should be as simple as possible and as complex as necessary based on the threat. Train hard, fight smart and survive.